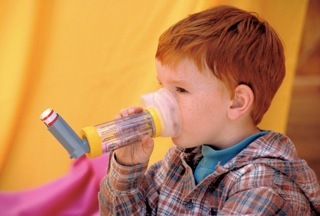 Make it easier for young children to use asthma inhalers « Howard J. Bennett - Pediatrician and Author in Washington, D.C. When children with asthma get to be two or three years of age, most doctors switch from nebulizers to handheld devices called metered dose inhalers (MDIs). There are two advantages to MDIs. First, they deliver inhaled medication faster than nebulizers. Instead of taking five or more minutes to complete the treatment, MDIs get the job done in less than a minute. Second, the size of the particles coming out of MDIs is smaller than nebulizers and therefore can penetrate deeper into a child’s bronchial tubes. Spacers comes with or without a mask that covers the nose and mouth. Younger children use the mask version. Despite these advantages, some children do not like the aftertaste of the medications used with MDIs. A great way to reduce this unpleasant taste is to tell your child you are going to give him two treats with his medicine. The first treat consists of a couple of chips that he can eat before he uses the inhaler. The chips coat the mouth with a salty/oily flavor that reduces the unpleasant taste. The second treat can be a small piece of candy or something else he can have once he’s finished. If you are opposed to giving your child candy as a reward for taking medication, a piece of cheese and a glass of juice may work as well. This entry was posted in Dr. B's Blog and tagged allergies, asthma, medication.